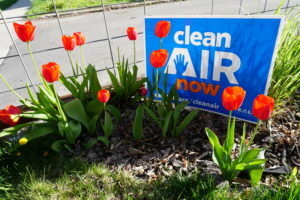 With increasing development and a growing population, it’s no surprise that clean air has become the dominant environmental issue in Utah’s northern urban valleys. 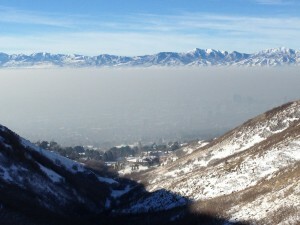 From Logan to Provo, our unique lifestyle amongst the mountains, which makes Utah one of the most beautiful places to live, also creates challenges with air pollution during both the winter and summer. The two primary pollutants we are concerned about are small particulate matter, or PM2.5, and ozone. PM2.5 is emitted directly from certain sources, and also forms in the air through reactions between nitrogen oxides (NOx), volatile organic compounds (VOCs), and ammonia. PM2.5 pollution is primarily a problem during the winter, when temperature inversions trap these particulates and create air that is not only unsightly but also extremely unhealthy. Ozone is primarily a problem during the summer, when reactions between NOx, VOCs, heat, and sunshine create invisible pollution that builds up throughout the day. This pollution causes a ‘sunburn’ on your lungs and can get worse at higher elevations. Emissions come from three primary sources – vehicles, area sources, and industry. Cars, trucks, and heavy-duty vehicles are the biggest contributors to our air quality problems. Area sources, which include buildings, homes, development projects, wood burning, and agriculture, collectively make-up the second largest source of emissions. Finally, industry, such as refineries, mines, power plants, and waste facilities comprise the smallest source of emissions, although significant state and federal regulations have helped them get to the levels they emit today. Several regions in Utah are currently out-of-attainment with federal air quality standards for both PM2.5 and ozone, making air quality an increasingly important issue for Utahns. One of the most visible effects of winter air pollution has on the environment is the grey or brown smog that gets trapped in the valleys, decreasing visibility. It is also unhealthy for wildlife in similar ways that it harms humans, and contributes to climate change. Poor air quality creates both acute and chronic health concerns. Exposure to pollution raises the risk and intensity of problems like asthma, decreased lung function, heart attacks, and can lower resistance to diseases, colds, and pneumonia. Families have reported moving out of Utah due to the problems air quality causes for their children and elderly family members. 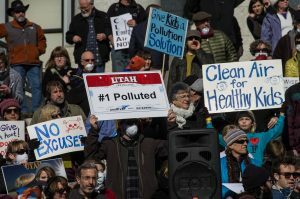 Air pollution disproportionately impacts the health of communities throughout Utah due to our unique geography and socio-economic factors. For example, communities living on the west side of the valley, where freeways and a majority of industrial sources are located, tend to have greater exposures to pollution than communities on the east side. There are a number of tools to track current air quality conditions. 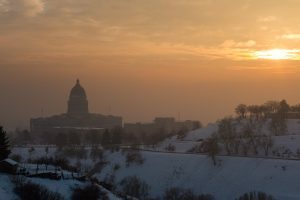 The Utah Division of Air Quality publishes a daily forecast based on current conditions. The Air Quality Index is also a measure of how unhealthy the air is at any given time and what groups should take precautions. Both can be found at https://air.utah.gov/. We develop and help to implement science-based solutions to reduce emissions and improve the air we breathe. Whether presenting innovative ideas to the legislature’s Clean Air Caucus or collaborating with local groups about ways to encourage individual changes, we champion solutions that focus on our biggest emitters — transportation, area sources, and industry. Working with regulators and legislators on both sides of the aisle, we help to create and implement policy solutions that reduce emissions. We collaborate with the Utah Division of Air Quality to provide feedback on realistic plans for emission reductions across all sectors and to hold polluters accountable. Through the legislative and regulatory process, we keep in mind that one-size-fits-all solutions won’t solve the problem or help every community, and work with a broad range of stakeholders to figure out how to be most effective. EPA: El Smog—¿A Quién Perjudica? National Geographic: A quantas personas mata del aire contaminado el ano?